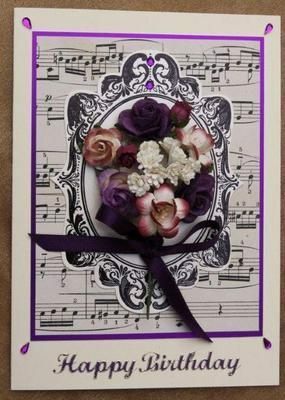 Perfect for a pianist, this card has a background of a Bach Fugue matted onto purple mirri card. 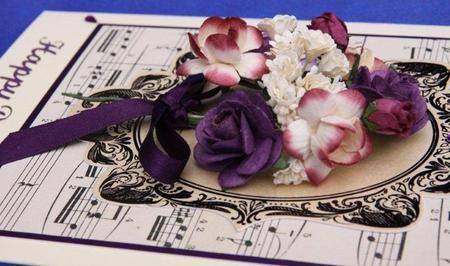 An elaborate cream and black frame surrounds a bouquet of purple and lilac paper roses, burgundy rosebuds, and cream and deep rose blossoms, all tied into a bouquet with purple satin ribbon. Purple teardrop crystals trim the corners. The words 'Happy Birthday' are in gold and purple and the paper insert reads 'Wishing You a very Happy Birthday'. All of these details can be changed using the 'Personalise' form. The price includes a tissue-lined box trimmed with matching ribbon and flowers.